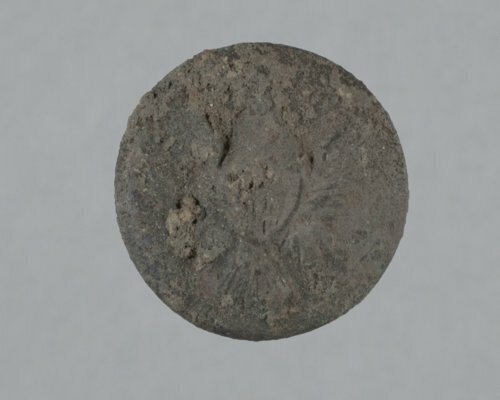 This General Service buttons was recovered at Fort Zarah, in Barton County, during excavations at the 1969 Kansas Archeological Training Program field school, a joint project undertaken by Kansas Historical Society archeologists and Kansas Anthropological Association volunteers. The button was made of brass and has a line shield on the front, indicating it was in use from 1855 to 1884. The button's back mark is too faint to read. The alpha shank attachment is present.